Hotpittayakom School is located at 199 M.10 Hot-Wanglung Road, Hangdong Sub-district, Hot District Chiangmai, 50240. The School is under the jurisdiction of Chaing Mai Secondary Educational office area 34. (Chiang Mai- Maehongson) the Telephone and facsimile number is 053-461109, the school’s E-mail address is Hodpitayakom@hotmail.com and our website iswww.hpk.ac.th.The classes we offer are from Matthayomsuksa 1 to 6. We have 928 students. There are 46 teachers, included the 40 government teachers and 6 employed teachers. The school current land area is 115 rai. 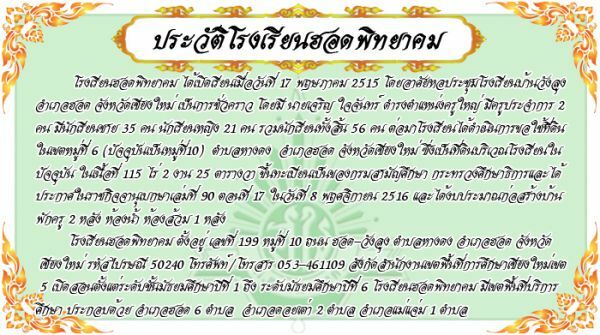 Hotpittayakom School Curriculum is divided into lower high school and upper high school. They are based on a core standard curriculum, school of 1998 with in sufficiency and towards ASAEN development. There are various rewarding courses for our students such as Science-Math, Math-English, Art-Social studies, Math-Computer, Chinese-English and Math-Accounting.